They are like flying scissors. Although they can be over an inch long, they fly quickly and land gently -- by the time you notice, it's too late. If you are a horse, cow, or deer, you flinch, swish your tail, roll in the grass, or try to outrun them. But they fly up to 25 miles per hour, and you probably won't get away. Blood will drip down your fur as your tough skin is slashed by sharp mouth parts, and anti-coagulant from saliva enters your wound. If you are afflicted by too many, you may weaken and die. If you are human, they will visit you in the pool or in the stream, especially when you splash or move quickly. What monsters of the woods and marsh cause such panic? It's the familiar and unpopular horsefly! Horseflies are part of the Tabanid family, part of approximately 3,000 species of biting flies which also include deerflies, black flies, and no-see-ums. Only female tabanids bite because they require a blood meal to develop their eggs. After their steak-knife mouthparts gash the skin, the pooling blood is soaked up by a sponge-like segment of the lower lip called a labellum. The males, meanwhile, have mouth parts for eating nectar and pollen while awaiting an opportunity to fertilize eggs of a blood-fed female. Flies go through four life stages: egg, larva or maggot, pupa and adult. Female tabanids lay eggs on vegetation over water or damp soil. The larvae, which may be aquatic, semi-aquatic or terrestrial depending on species, hatch from the eggs and drop to the ground or water where they become voracious predators of small invertebrates. The larvae grow and molt over several months or years, again depending on species, and eventually move to drier soil to pupate for 5-21 days, after which they emerge from the soil as adult flies. The year or two following a wet summer will see an increase in horseflies and deerflies because they thrive in boggy soils and heavy vegetation. Southwest Ohio is a horsefly haven! Ordinary fly traps will not catch horseflies and deerflies because these flies are not attracted to chemicals or smells. Instead, they are attracted to motion and perhaps have the ability to see heat from the electromagnetic spectrum. Because they detect their victims by sight, they are day-feeders and are especially active on sunny days, much to every swimmer's dismay. They seek a dark moving object which could be the head of a horse, cow, deer, human or other mammal. Some species of tabanids dine on reptile blood, including that of alligators! 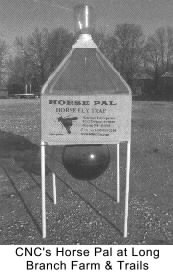 As an experiment at Long Branch Farm & Trails, we purchased a horsefly trap, called the Horse Pal, from a company in Wisconsin. The trap utilizes a horsefly's feeding habits to trap it. The trap consists of four powder coated steel legs and a large black ball on a wire that swings in the breeze. It is placed in full sun in an open area, and from a fly's point of view, it must look a bit like a grazing animal with a bobbing dark head. Horseflies notice the target and zip under the "belly" of this animal, seeking a place to bite. By the time they realize their mistake, they have flown upward and become trapped within the funnel which leads to a glass jar. This trap was used last summer and it really works -- up to 25 horseflies and deer flies were caught daily! Although farmers and swimmers might like to eliminate horseflies altogether, keep in mind that, like all living things, these insects have an important role in the food chain. Horseflies are a tasty food for dragonflies and birds, and their larvae and pupae may feed shrews, moles, mice, birds and even other invertebrates. As humans, we walk the line between protecting our own interests while serving as stewards of the land. It would take a whole lot of horsefly traps to make a dent in the tabanid population, but the cattle at LBFT may be more comfortable because of a "Horse Pal."